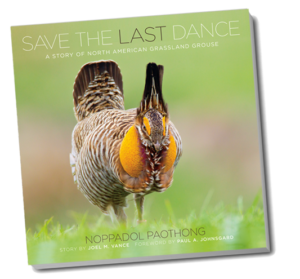 This 204-page hardbound book, Save the Last Dance – A Story of North American Grassland Grouse, captures the dazzling beauty of seven grouse species whose populations are diminishing across the prairies and plains of America – and one species that has already lost its battle for survival. Fortunately, many conservation groups have championed the cause of grassland grouse. The birds can be saved if enough people care. The book fosters knowledge and understanding of these spectacular birds and their diminishing habitats so future generations, too, can marvel at their grace and beauty. 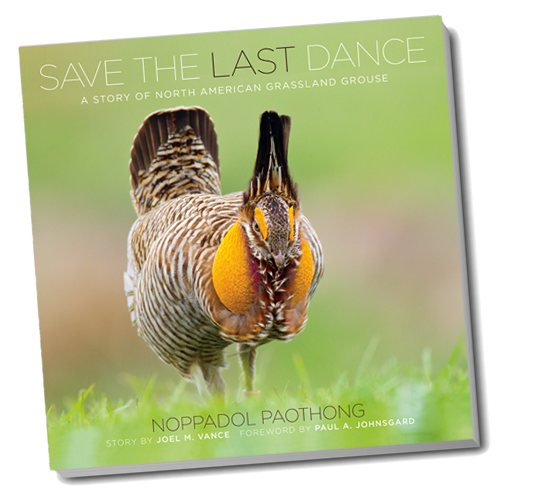 The book covers the following species: Heath Hen, Greater Prairie-Chicken, Lesser Prairie-Chicken, Attwater’s Prairie-Chicken, Greater Sage-Grouse, Gunnison Sage-Grouse, and Sharp-tailed Grouse, along with conservation efforts to save these species. “… I hope this book will be a window for people to glimpse the life and beauty of these extraordinary species – the birds that I have come to care so much about during the past 10 years of photographing them. Noppadol Paothong is an award-winning nature/conservation photographer. his focus has been on rare and endangered species, and primarily on grassland grouse and their fragile habitat. He is a staff nature/wildlife photographer with the Missouri Department of Conservation. Joel Vance worked for 22 years as an award-winning news and magazine writer for the Missouri Department of Conservation. He has published eight print books and two e-books. He has been awarded all three of the top honors bestowed by the Outdoor Writers Association of America — one of only three members in the history of the organization to be so honored. Paul Johnsgard is a renowned ornithologist, artist and emeritus professor at the University of Nebraska. His works include nearly fifty books including several monographs, principally about the waterfowl and cranes. He is considered one of the most prolific authors of ornithology books.